TH E M R EP O RT | 25 FEATURE BancForce is an organization founded by financial professionals, for financial professionals specifically to service the hiring needs of banks, credit unions, mortgage, and financial institutions. We are a full service staffing firm that offers, temporary, temp-to-hire, and permanent search services. 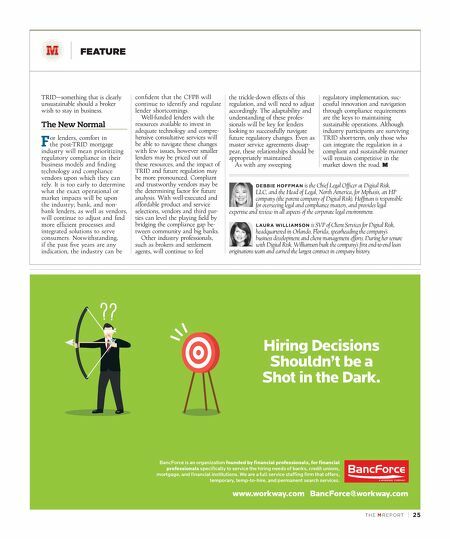 A WORKWAY COMPANY www.workway.com BancForce@workway.com Hiring Decisions Shouldn't be a Shot in the Dark. TRID—something that is clearly unsustainable should a broker wish to stay in business. The New Normal F or lenders, comfort in the post-TRID mortgage industry will mean prioritizing regulatory compliance in their business models and finding technology and compliance vendors upon which they can rely. It is too early to determine what the exact operational or market impacts will be upon the industry; bank, and non- bank lenders, as well as vendors, will continue to adjust and find more efficient processes and integrated solutions to serve consumers. 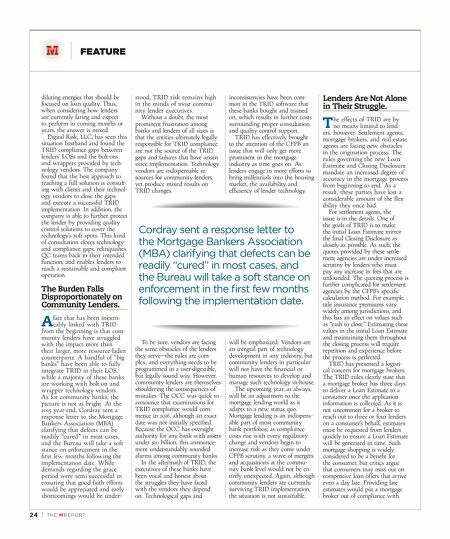 Notwithstanding, if the past five years are any indication, the industry can be confident that the CFPB will continue to identify and regulate lender shortcomings. Well-funded lenders with the resources available to invest in adequate technology and compre - hensive consultative services will be able to navigate these changes with few issues, however smaller lenders may be priced out of these resources, and the impact of TRID and future regulation may be more pronounced. Compliant and trustworthy vendors may be the determining factor for future analysis. With well-executed and affordable product and service selections, vendors and third par - ties can level the playing field by bridging the compliance gap be- tween community and big banks. Other industry professionals, such as brokers and settlement agents, will continue to feel the trickle-down effects of this regulation, and will need to adjust accordingly. The adaptability and understanding of these profes - sionals will be key for lenders looking to successfully navigate future regulatory changes. Even as master service agreements disap - pear, these relationships should be appropriately maintained. As with any sweeping regulatory implementation, suc - cessful innovation and navigation through compliance requirements are the keys to maintaining sustainable operations. Although industry participants are surviving TRID short-term, only those who can integrate the regulation in a compliant and sustainable manner will remain competitive in the market down the road. DEBBIE HOFFMAN is the Chief Legal Officer at Digital Risk, LLC, and the Head of Legal, North America, for Mphasis, an HP company (the parent company of Digital Risk). Hoffman is responsible for overseeing legal and compliance matters, and provides legal expertise and review in all aspects of the corporate legal environment. LAURA WILLIAMSON is SVP of Client Services for Digital Risk, headquartered in Orlando, Florida, spearheading the company's business development and client management efforts. During her tenure with Digital Risk, Williamson built the company's first end-to-end loan originations team and earned the largest contract in company history.